Given that the Anima is our least developed conscious archetype, it’s not hard to understand why it would be seen to be of little value in finding a career. Herein I’m asserting that the opposite is true. 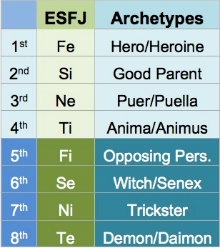 My findings are based on applications of John Beebe’s theory of type and archetype, in which the eight mental processes (Fi, Fe, Ti, Te, Si, Se, Ni, Ne) are paired with eight archetypes, four conscious (Hero, Good Parent, Eternal Child, Anima) and four unconscious (Opposing Personality, Witch/Senex, Trickster, Demonic/Daimonic). Jung and his colleagues, in particular Marie-Louise von Franz, identified the inferior function as corresponding to the Anima (von Franz, 1971). The Anima is the feminine energy aspect within men and the Animus the masculine energy in women. This position is an area of natural weakness, and conventional wisdom says that one’s strengths and competencies, not weaknesses, should guide career choice. We tend to experience the Anima simultaneously through feelings of shame and admiration—our own inadequacy with the function in this archetypal position makes us look up to or desire those who appear competent in it. This insecurity leads us to an avoidance of the function in combination with an attraction to it, and it is this attractive quality that can lead to a deeper satisfaction in a career. This is why most graduates will exit college seeking satisfaction at the level of the Hero; they search for a job in which they fulfill a needed role and little more. If they are lucky or aware enough to look for it, they may find a position that allows them to offer some counsel in the direction of the company, or to offer guidance on projects (Good Parent function, auxiliary), or that engages their sense of play (Eternal Child function, tertiary). Rarely are they encouraged to examine their soul (Anima function, inferior) in finding a career. Moreover such a notion, divorced from its psychological meaning, devolves into little more than New Age wisdom with little practicality. Occasionally though, our Hero worship can outwit us and lead us back to our Anima unintentionally. As a member of this generation of new college grads, I have many peers who struggle to identify a career direction that makes sense for them. I have been exploring career choice and typology in my generation and have observed that an unusual acceleration of the stages of life seems to be occurring in some individuals. In particular, the Anima/Animus, which is normally associated with mid-life, appears to be more active in the millennial generation. I propose that this accelerated maturation has a lot to do with the increasing availability of psychological information online, particularly Jungian theory. More and more scholarly resources are being offered for free; this dissemination of knowledge creates a broader awareness of psychological phenomena within our culture and could be leading the more internet-savvy generation into earlier self-awareness. This of course contradicts common knowledge about my generation. Brooks says that my generation is “over-supervised,” and Gottlieb says there is too much focus on happiness and choices. I do not disagree, but I think an opposite, and what Jung might call ‘compensatory’ movement, is also occurring. New graduates face a peculiar challenge in our current economy: we rarely have direct paths to employment. We have to think hard about career choices. I would argue that when we choose work that allows our inferior function to experiment, we find satisfaction even if that allowance is unconscious. So perhaps we have to grapple with what Jung called “the Anima problem” sooner than previous generations. She talked about growing up in a small church setting in which, being the pastor’s daughter, she was delegated to teach Sunday School. From her description, this seemed something of an imposition made on her because of her family’s role in the ministry, and not actually an initiative she had taken on her own. But she was quickly complimented on her proficiency at teaching and encouraged to think about it as a career. Given her rather lukewarm feelings about teaching, my suspicion was that it was not so much the professorial role of Good Parent development (auxiliary introverted sensation, Si) that attracted her to her current position but something at a different level entirely. While her introverted sensation may have proved a strong complement for teaching out of a recorded history as variegated as the Bible, this seemed to be too straightforward an answer in explaining why she had continued to teach post-college. The next clue was in the surroundings of her upbringing. She described how, after growing up in rural Colorado, a tiny town of dirt road proportions, a desire for diversity eventually led to her attending a college close to the inner city of Chicago and the notorious Cabrini Green housing project. It was the college’s relationship with this troubled neighborhood, offering many opportunities for her to serve and interact, that attracted her to the college. After graduating, she found her way to Los Angeles and began to teach in one of the worst school systems in America. (California is nearly at the bottom on state educational rankings, and the financial crisis, which would arrive only a few years after she did, worsened the already crippled system.) Why did she choose LA? The obvious answer would be the Heroic satisfaction that came from the social justice element of what she did in Chicago. As before, it appeared to be an opportunity to rescue the neglected—practically a siren song to her extraverted feeling Hero (Fe). And yet the first few years would prove to be anything but what those romantic notions had promised. The children were brutal and rude, disinterested in learning, and continually vicious toward her and each other. She described her first year in LA as a torment: She would drive along the freeway each morning, sobbing the entire way to her classroom. Her Hero had been eviscerated. Being a young white woman working in South Central LA, she was an instant outsider and her first-year status made her an easy target for the students. It should not come as a surprise then that many college graduates who go straight into these kinds of teaching positions do not last beyond their first year. They head elsewhere, and those once-promising Heroic visions portrayed in films like “Stand And Deliver” fade with the realizations of the scope of the problem at hand. Failing schools, as many teachers in these communities will tell you, are only a part of the larger systemic problems. While education will no doubt be part of the solution, there is a strong disillusionment that comes with seeing just how much inner city children must overcome to succeed in America today, and how little a teacher can truly change given the pervasive disadvantages they face. And yet, she has remained a teacher for five years and says she will probably continue to teach in some manner for the rest of her life. Why is this? While her Heroic extraverted feeling has, over time, built the kind of rewarding relationships with her students that it specializes in, what could have possibly kept her coming back despite that first heartache? The answer, I maintain, goes back to the issue that drives many young teachers away. Her introverted thinking Animus (Ti) was aroused by the scale of the difficulties at hand: Systemic refinement is the specialty of introverted thinking. While the classroom offered her extraverted intuition Child (Ne) a chance for something new every day, and gave the introverted sensation Parent a chance to recount and lecture, and provided the extraverted feeling Hero with a chance to socialize with the students, it was, ironically, the systemic problems that compelled her to continue. The Animus plays an interesting role here. Because it is engaged indirectly, its competency is not directly challenged. A teacher is expected to run her classroom well, not to fix the entire educational system. But those who continue are often motivated by this indirect challenge. Their personal experience within the system allows them a chance to analyze its flaws and help engineer solutions. That’s how she progressed to eventually become one of the founding teachers for a new charter school, and why her dream, to one day start her own institution, would offer an even fuller engagement with her Animus. It seems obvious that the initial allure for her Hero was quickly stripped away by the harsh environment. Yet she persisted. The deeper, idealistic draw on the Animus was what helped her overcome this and turn teaching into a deeper passion rather than a short-lived idealistic crusade. This is why, in general, I do not disagree with the sacrificial ideal Brooks advocates in his article. Satisfaction in a career does require self-sacrifice. Where I differ with him is in which part of yourself must make the sacrifice. I think many of us would be quick to put our inferior and embarrassing Anima on the pyre, and happily satiate our Heroes. But the Hero needs to sacrifice its preeminence and allow the Anima to experiment and thrive if we are to find ourselves truly committed to what we do, not to mention be fulfilled by it. Another individual I interviewed for this study moved to Los Angeles for a more typical reason: to pursue an acting career. An assessment of his psychological type revealed once again how the Anima needs a safe way to express itself but also how it can overcome the negativity of archetypes expressing themselves unconsciously. His reported type was ISFJ, but we explored many other types in the self-selection process. One of the most interesting aspects of going through his assessment with him was his initial resistance to introversion as his dominant attitude. While initially expressing deep uncertainty about having introverted preferences, he came to see how his self-perception was skewed by expectations his career had put on him. The film industry makes tremendous demands of extraversion on actors: Networking with other individuals is the primary path to success in film, and many with introverted preferences must quickly train themselves to adapt to this taxing style of work. Because he had already lived this way for several years, he had adjusted to this new constraint and was at first skeptical of having an introverted dominant. 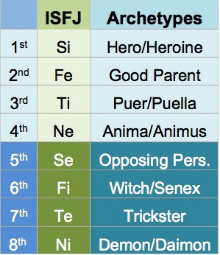 However, his ISFJ preferences also dictated extraverted feeling (Fe) as his auxiliary or Good Parent function. His second function was a great fit for the pressure to network in the city, provided he could find the right environment to engage it. In fact, he had put himself into an actors’ network where he was a leader and mentor, so in that way he created a way to more naturally access his socializing function—through a parental role. There was one other odd twist to his story. He confessed that he had struggled for many years with an aversion to performance, and that he even considered giving up acting entirely. Memorization was never a problem for him—his introverted sensation Hero was readily able to memorize and reproduce his lines. What he struggled with was the actual sensation of acting. He described something different from typical stage fright: not so much fear as a massive kind of inner resistance and discomfort, as if pushing against a wall. He had no idea where this resistance came from or why it was happening. I speculated that he was experiencing his extraverted sensation Opposing Personality (Se 5th). This function which is opposite in attitude from the dominant can produce a feeling of resistance or opposition, almost as if battling the will of a different person. It seemed that the sense of resistance he experienced to the act of performing, engaging in the moment through body and speech, was activating this archetypal oppositional energy at a deep level. This made the start of every performance extraordinarily difficult. After a certain point, the feeling of resistance would diminish but would never quite disappear entirely. The stress of this sensation became so draining for him that he seriously considered quitting acting altogether, giving up years of training, and starting anew in a different profession. I asked what had kept him going and why, in spite of such discomfort, he had moved across the country to live in Los Angeles and pursue an acting career more seriously. He said that, while he had considered several different career options, he knew that he wanted to be around creative, imaginative people. Quick to dismiss his own abilities, he said he was deeply impressed and attracted to those who developed the stories and ideas from which movies were born. He persevered in his acting because he knew that whatever the outcome, he wanted to work in an industry engaging these types of people. This desire was a safe kind of indirect engagement with his extraverted intuition Anima. His idolization of creators of stories is typical of the admiring quality associated with it. But he was also giving himself a very safe and structured way to flex his own imaginative muscles. Each role was another chance to put himself into the mindset of a character. While each role was governed by the structure of the script and the authority of the director, determining the mindset of the character was up to him entirely; he could experiment with his own creativity and imagination internally without being responsible for something as big as a script or an entire production. And he could work side by with the creative types he admired. While his Opposing Personality had much to object to about the extraverted sensation demands of performance, his Anima was being given a way to experiment in tandem with a happily competent introverted sensation Hero. 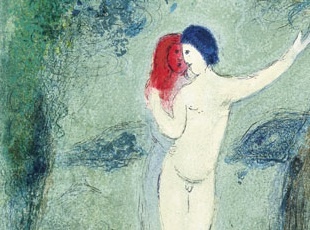 This example illustrates how the attractive qualities of the Anima can compensate somewhat for the negativities of archetypes operating unconsciously. This actor continues to perform but no longer experiences anything like the resistance he first encountered in trying to use his Opposing Personality function, Se. While I think this clearly points to psychological development, I am less certain about whether it was the direct engagement of the fifth function that created his comfort with it, or the balancing effect offered by a Hero/Anima engagement with the role. All of this seems to go against the timeline that has been more typically put forward for Anima activity. All of the individuals I interviewed are recent graduates, and yet several of them seem to have effectively engaged their inferior functions, working with them in such a way as to experience satisfaction in spite of awareness of inferiority. Moreover, they demonstrate exactly the kind of engagement with a career that Brooks claims my generation is not being prepared for. And in some ways I must agree. When selecting a career, we are taught to pursue our perceived gifts or interests. But often it may be the abilities we cannot perceive in ourselves or that we admire in others that could have a dramatic effect on our satisfaction and ability to commit. The Anima image always bears an opposite gender in part to represent this weakness or unfamiliarity. Sensitive to our inability with it, we may avoid work that appears to challenge the Anima too directly. But if we pick a career path too divorced from engaging this function, especially over the long term, we risk putting ourselves into a position of greater unhappiness. If we do not address such concerns from a typological perspective, I think it unlikely we will ever coach students well on how to make these decisions. And without an understanding of both the archetypal and mental function dimensions of typology, even a student aware of his or her personality type will be insufficiently prepared to select a career path. Simply put, a four-letter code does not afford the necessary nuance to understand a phenomenon as intricate as this and probably hurts perception of self more than it helps. Both of these individuals were familiar with typology at a basic level, having previously been through a Myers-Briggs® assessment of some kind. Both found the experience to be a limiting one, and both agreed that the four preferences seemed insufficient to provide a good description of themselves. In short, they had little regard for typology before our sessions. As I began to introduce them to the depth of Jung’s work and of their own personality according to the eight functions and archetypes, their perceptions shifted. Earlier mysteries and idiosyncrasies of self began to make sense when seen within this larger structure; in particular, the function-archetype information clarified and affirmed their feelings of passion towards their respective careers. There could be several possible explanations for seeing the Anima playing such a strong role at such an early stage of life. The first is that these are simply outliers in the broader population; that my selection bias in finding other young people devoted to their careers naturally led me to those with a higher level of individuation. The second is that their previous type assessments began an awareness of such elements that naturally led them to this point. While these are viable explanations, I would posit something very different, namely that, because such terms and ideas as archetype and anima have now entered the greater cultural consciousness, we may be witnessing a developmental shift. The kind of development that would normally have taken place at mid-life is, in some cases, beginning much earlier. If we are indeed experiencing an acceleration in psychological growth, it would appear to coincide with Arnett’s claim that a new intermediate stage of life is appearing in our generation. The opportunities for independence and self-exploration that he highlights for 20-somethings are fertile ground for a newly awakened Anima. With the advent of online publication and social media, esoteric concepts like typology can be spread with exponential swiftness. Psychological self-exploration/self-awareness could be accelerated in the Facebook generation, a population currently considered by some to be developmentally delayed, overprotected, and irresponsible. Knowledge that would have once been available only to academics is beginning to permeate the broader culture at a much greater pace. Individuation itself, one could argue, is being accelerated for our species the more these topics are studied and made accessible to the broader public. This generation’s ”outliers” could be the next generation’s norm. This is why I advocate that education about these subjects is vital and valuable, especially from our institutions of higher learning. I am much more optimistic about this generation’s preparedness for challenge than David Brooks. The knowledge required for psychological growth is available and can be taught. It does not require any great revision of how we are preparing our graduates for the world. All it takes is a willingness to urge the graduates to know themselves first and use that self-knowledge in determining their path. Arnett, J. (2010). Oh, grow up! Generational grumbling and the new life stage of emerging adulthood. Perspectives on Psychological Science 5(1) 89-92.
von Franz, M-L. and J. Hillman. (1971). Lectures by von Franz, the inferior function; and Hillman, the feeling function. Spring Publications. 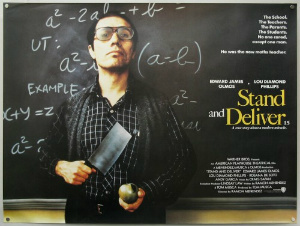 “Stand and Deliver,” 1988, Warner Bros.
Casey Samulski studied literature Sarah Lawrence College in 2007, became MBTI®-certified in 2009, and holds an MFA in fiction from Columbia University. 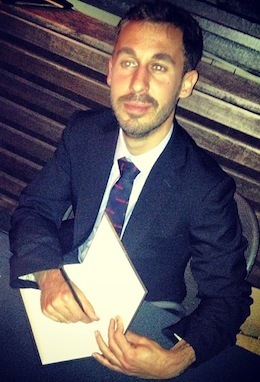 He is a published novelist and journalist for The New York Press, The Villager, and City Limits. His science fiction novel is titled The Water Sign. He now does business development for a high performance polymer startup, Allotropica Technologies. His talk on the Hero archetype at the APTi 2011 conference in San Francisco is available here – http://vimeo.com/37601655.